May I wish you and your friends and families a really Happy and peaceful Christmas, and you get all you wanted! Seven Years war - a different view! Today we returned to the Seven Years War for our last game before the Christmas break, Lawrence had his Reichs armee and French, while I had Phil as a sub commander, using my Prussians. Our brigadiers were, however, a poor lot, none were competent, and 4 were actually incompetents! Lawrence's were on the whole, average...at least that meant they knew what they were doing most of the time!!! 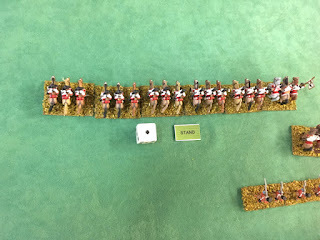 Phil had a cavalry brigade on the left siupported by 2 infantry brigades, deployed in depth. 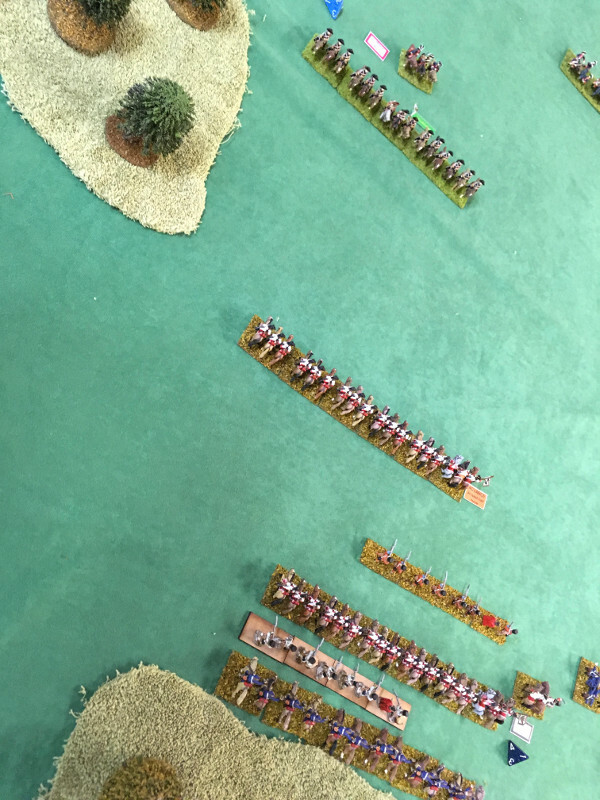 I had 2 infantry brigades, my right hand one being composed of Grenadiers, and a cavalry brigade on the right. ... a small infantry centre (?) and cavalry on his right flank. The Prussian plan was to attack with our left while the right held up the Austrians! Phil initially had trouble getting his incompetent cavalry commander to advance! - I sent Frederick to give them a hand! Eventually Phil's wing were advancing, my men were echeloned back. Frederick was still trying to get Phil's dragoons moving! The Austrians were even disordered by my artillery as my Kuirassiers charged! Amazingly, the Austrians held! KR10 fell back to reorganise! Brettlach fell back, too, through their supporting lines, disordering them en route. Lawrence got them moving out to the flank, but the rest of the command were still trying to reorder their ranks. ...while a regiment of dragoons went to contest the marshy ground with Phil's Frei Korps. Phil finally got his cavalry wing well spaced to attack. On my wing, Lawrence disclosed a large French cavalry brigade in the woods. My horse were now outnumbered 2:1! As the French horse tried to filter out of the woods, Austrian regiment Trautmannsdorf advanced with some Grenzers to face my KR11. Lawrence got his right wing to attack Phil's advancing Kuirassiers. Both sides met in a flurry of sabres! Then the combat devolved into a confused melee! In the marsh, his dragoons were driving off the Frei Korps. ...who panicked, and broke disgracefully! KR11 charged into Regiment Trautmannsdorf - with one squadron scattering the vulnerable Croats. 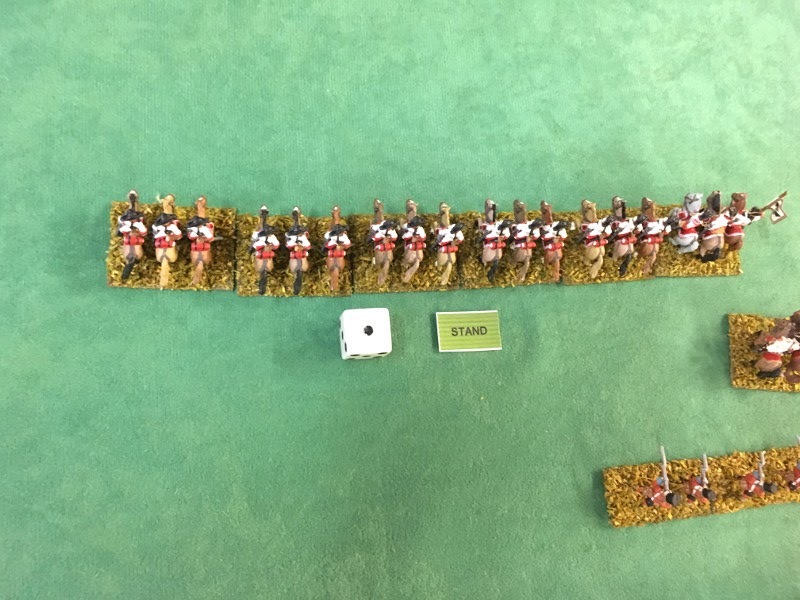 Phil's Kuirassiers broke their opponents, after a bruising melee. With a fair number of their horse in full flight, some of the Reichsinfantrie began to retreat! Some previously unseen French infantry in the wood also went into retreat! With his army degenerating into disarray, Lawrence decided to break of the action! Although his dicing was better than last game, it still failed him at a couple of critical junctures! Better luck next time pal! Today, Lawrence was off unwell, so it was left for Phil and me to arrange a game, and Phil chose Sails of Glory, so we opted for using French frigates against the RN! Phil took Le Succes, I the Courageuse. Although there were islands on table, they were upwind of us so no danger. Against us were HMS Orpheus and Cleopatra. They had better guns, we stronger hull burdens. ...They turned upwind to slow their movement. We were well out of range, and both sides moved to get advantage. The English moved into line abreast. We headed straight past them. One of us would have to commit to an exchange of fire! Phil turned as the English broke formation to attack us. Phil and I fired together, I got a bow rake on HMS Orpheus. My fire was most effective, causing mast damage. 3 hull boxes down, that made Orpheus less dangerous! Phil got more fire on Orpheus as they passed. HMS Orpheus fired back ineffectually. Phil managed to hit HMS Orpheus again after a sharp turn. I was heading out of the action as I misjudged the English likely actions! Le Succes lost a crew box to English musketry. to which she could not reply. Phil engaged both English ships, beating both of them! HMS Cleopatra was lightly damaged, but ok.
HMS Orpheus was badly damaged. ...and my Courageuse was virtually undamaged. I turned to try to rejoin the action while the rest of the ships licked their wounds and reloaded cannon! HMS Cleopatra and Le Succes holed each other with their next exchange of shot. HMS Orpheus's fire was very poor, as she was now close to being a wreck. I finally got Courageuse heading back in the direction of the action! I was still far away from helping Phil, who was still running rings round the English. Le Success fired on HMS Orpheus as I closed on her stern. Orpheus lost some crew, but was not damaged otherwise. My fire made up for lost time, setting HMS Orpheus on fire! Pretty period - isn't it! ... causing light damage on Courageuse. As I closed, my musketry killed several of her crew. Cleopatra was moving to engage Le Succes. I got a devastating volley in. Her crew struck the colours, but the ship probably burnt to the keel! Meanwhile, Le Succes got a stern rake on HMS Cleopatra. I managed to damage her too. I lost a musketry duel with the Cleopatra. ...and forced her to strike too! All in all, a good day for Les Francaises!